You may initially think, well, it depends on how long you spent queuing. I have heard stories of people waiting for 3 hours, 5 hours, 10 hours. From dawn ’til dusk. At one hysterical point it even gained that legendary status, usually only afforded to super-brand Apple or the new World of Warcraft game, of people dragging their pop-up tents through the sweaty caverns of the Circle Line to camp out all night. All for a glimpse of the new work produced by an artist Brian Sewell calls a ‘vulgar prankster’. So was it worth it? Without a doubt. If Brian Sewell hated it, it means it is certainly worth seeing. Mr Sewell (ever noticed how his name sounds strikingly similar to Sewer?) is rather like a compass pointing towards a bear pit in the dark. Whatever it says, generally go the other way. I personally had a rather extreme reaction to the show and was quite overwhelmed by the scale and colour, almost bursting into tears in front of the vivid A Closer Grand Canyon, 1998. The exhibition puts you slap bang in those glittery red shoes belonging to Dorothy just when she arrives in Oz. Technicolour wonderland. You feel as if this is what the world should be like, with a hint of jealousy that he saw it first, that this is the way he sees the world. Not only that, but that he can convey it with such abandon. You are struck by an overwhelming sense that this man has mastered his craft. Yes he is technically superb, as you can see from the stunning charcoal preparatory drawings which intersperse the paintings and provide a crystal contrast, but he is also deeply and firmly rooted in his niche. His style is obviously still reminiscent of his much earlier and most well-known works, A Bigger Splash, or Mr. and Mrs. Clark and Percy, for example. But the awkwardness of that sterile utopia has been replaced with a hyperactive excitement at the natural world. The natural world as it is in Yorkshire, no less. The concept of a kid in a sweetshop comes to mind; it’s there, they’ve got it, they can’t get enough of it. It makes you smile. Well, it made me smile. A lot. Aside from being a celebration of the beauty of nature, the works tell a story. They are a study, or rather, many studies. Hockney spent countless hours meticulously photographing, recording, collecting and painting, to capture the scenery across the changing seasons. Some say the British seasons are the most wonderful, as the extremity of change creates the most striking contrasts. I would certainly say they had a point after seeing these works. 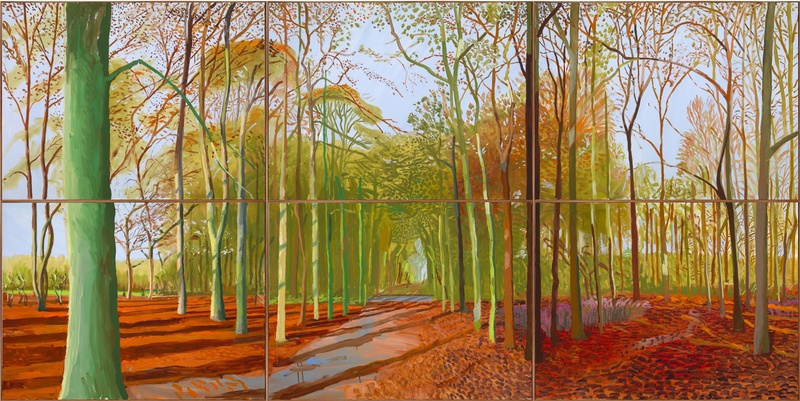 Hockney has often portrayed the same scene 3 or 4 times at different times of year and the effect is startling. No more so than in the Ipad room, where a spectacular headline piece entices you into the space. I strove to ignore it and to save it for last, like my favourite food on a dinner plate, and made my way round the room full of prints. Ever the techno-geek, Hockney took it upon himself to learn to paint on the Ipad, using a Paint app. The resulting enlarged prints are primarily, for me, a visual representation of development and exploration. They were not visually my favourite pieces in the exhibition, but then I don’t think they were meant to be. Dated by when they were completed (generally one a day, which alone is pretty amazing), they traced a very visible learning curve which was fascinating to follow. It led me clockwise around the room and to the astonishing crescendo of The Arrival of Spring in Woldgate.